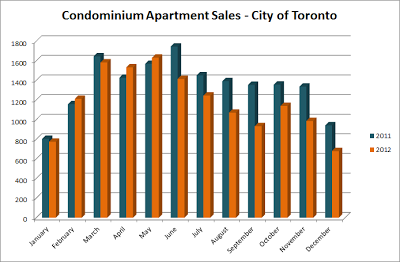 Many of you have heard that there was a drastic crash in sales volume across the GTA. 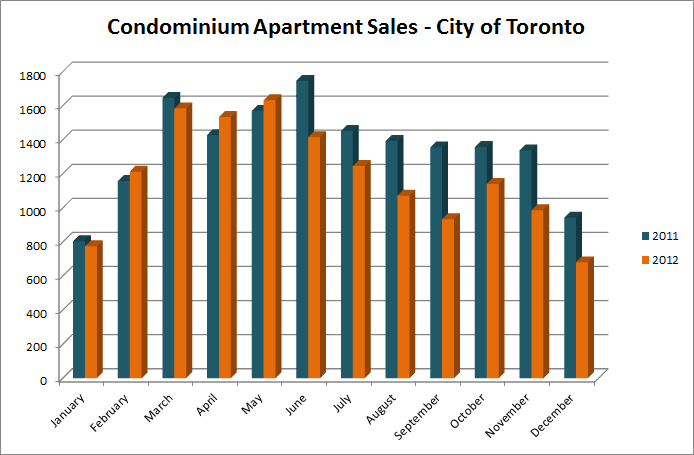 For instance, in City of Toronto, the sales volume of condominium apartments had crashed almost 27% in December compared to the same month in 2011. In contrast, the decline of the average price of condos was not as dramatic, and was only 1.8%. Please consider the chart below, which is based on TREB published data. Take a look at June 2011/2012 above, that's the beginning of an end. Now the real estate industry would attribute the crash in sales volume in the beginning of the summer to Flaherty's change in mortgage policy (the reduction of maximum amortization period from 30 years to 25). However, the new rules came into effect only on July 9th, but the sales begin to decline in June 2012. Something else was going on - but not the mortgage rules game changer. In fact, one would expect that sales volume would pick up in months prior to the change of the rules so you can lock in into five year fixed mortgage at 30 years. Yet, that is not what happened. What happened was that the population of greater fools had shrunk almost overnight, and the buyers' thinking had shifted. Now a quick history lesson from 2006 in Phoenix, AZ where sales had crashed double digits, inventories had skyrocketed, yet the prices had held or dropped modestly. Hm, that history lesson kind of reminds me of where I live now. When I look out my window, I see dozens of cranes, which means more condos. But for whom? Moreover, according to Globe and Mail, Urbanation is tracking 240 000 units that are planned to be built in Toronto, which represents a 20 year supply. Now take a look at the chart below. Almost immediately following the sales crash, prices had started to decrease modestly. July prices were down by 1%, August down by 4%, November down by 4%, and December down by 1.8%. Now if you look over at September, that's an 8% increase. That's random, but that's also when school starts, right? If I was a real estate agent, I would have guessed that the rich Chinese are buying condos for their kids who started university in T.O. 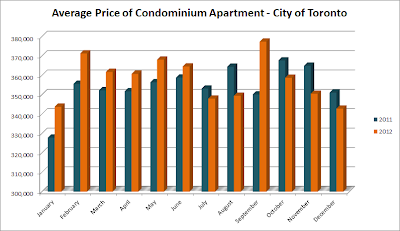 Otherwise, September may be looked at as the peak of Toronto Condo Bubble.